Standard S540 CNC control with 10.2” TFT screen and interactive 2D graphic editor for MBHS series with 3+w and 4+w and 6+w axes. Hydraulic synchronized RAM parallelism control compensates unven force on the bend by means of hydro-electrical technique. 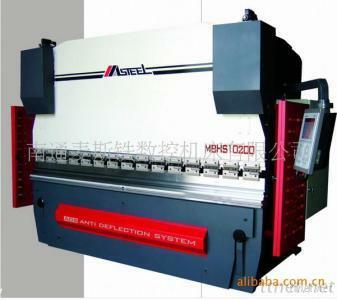 Servo CNC back gauge with precision ball screw and linear guide way ensures unsurpassed rigidity and high productivity speed. Back gauge position speed at 8”/s, repeatability at ±0.001”. Automatic or programmable back gauge retract feature. Auto and programmable pressure control. Programmable RAM top stop and slow bending position.